Of all the picky eaters I spoke to, I found no one that credited books as a picky eating cure. Apparently, I am alone in this freakishness, but I stand behind my prescription. It's a fact that there exist certain books that have done the unthinkable and made me want food I hated. I'm not talking about cookbooks or foodie memoirs, either. My inspirations were much weirder. For instance: Russell Hoban's Bread and Jam for Frances tempted me to try soft-boiled eggs when I loathed eggs in every form; Gerald Durrell and My Family and Other Animals had me craving grilled tomatoes on toast even though I despised tomatoes; and Sweet Valley High got me into asparagus. However, there were some books containing foods that made me extremely happy I didn't live in their stories. Like, the Bible. I mean, what really was that manna stuff that kept Moses and the Chosen alive in the wilderness? "I have always pictured manna as a big, white, round, somewhat flat, sponge-like mushroom because mushrooms can appear overnight." "Okay...so I always thought it was just like pita bread. I have no idea where that came from, but just like pita bread. Flat, boring, fill-you-up pita bread." "I think of manna as pale, cream colored flakes, a lot like how instant potato flakes look." "I imagine it a little like rice paper without a lot of taste or texture." Finally, I came across a New York Times article that talked about the very real modern day existence of manna. 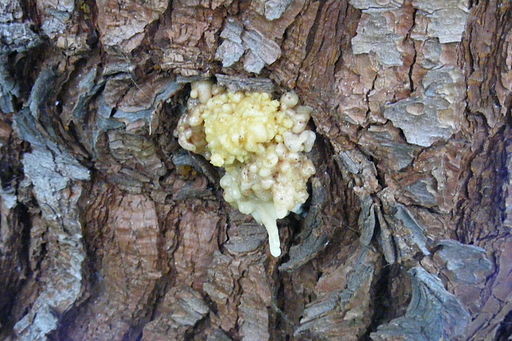 While the photo that accompanies the article makes manna look like earwax, writer David Arnold describes the "dozens of varieties" of manna as sweet tasting and explains that while some manna is dried plant sap or cloudy lichen, other varieties might be "honeydew excreted by bugs that eat the sap" or beetle cocoons. Look, I know that people all over the world -- maybe all over my own state -- eat bugs because they are (ALLEGEDLY) a good source of protein, but those people don't live in my house, so I'm just going to continue to be grossed out, okay? Unless they came from the sea and are served with melted butter, this moderately picky eater will not eat bugs. Nor will she eat by-products from bugs, even if you fancy up those by-products with words like "honeydew excretion." In his article, Arnold notes that the biblical manna was probably sap from a tamarisk tree (or salt cedar), which can grow in the drier climates of North America, but is actually native to the Mediterranean, Africa, and Asia. Do you feel like eating manna for forty-ish days and forty-ish nights? Well, guess what? Now, you can because since 2008 Behroush Sharifi, a New York-based importer, started getting in two kinds of manna from Iran, and some New York chefs are serving it up in their restaurants. Arnold describes one form of manna as tasting like "a combination of maple syrup, brown sugar, blackstrap molasses, honey and nuts" and the other as "sweet, with some gumminess that eventually dissolves in the mouth" and with "notes of honey and herb, and a faint bit of citrus peel." It's amazing the nuance you can eke out of beetle cocoons. Meanwhile, now I'm wondering how long it will be before manna starts showing up on San Francisco menus. Picture it: "Frog Hollow peaches served with locally-sourced grated manna cocoon and gilded with honeydew excretion." People, I don't even like honeydew melon, so imagine how I feel about excretion. In conclusions, between the bug poop and the feeding of the five thousand where, in my callow anti-pescaterian, picky youth, I would have been all, "Just loaves please, Jesus, no fishes," I would not have gotten on well in biblical times. 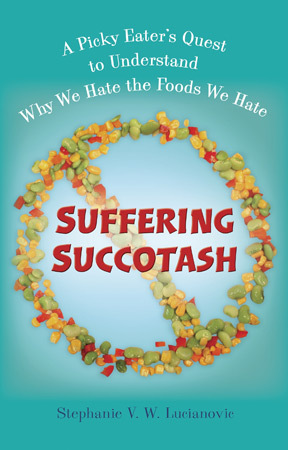 Next Time in "God Food is Not Good Food": Disgustoid marshmallow salad a.k.a. Ambrosia.